our stay, and so it didn’t bother us too much when our wellies were flooded with river water after testing how far into the river we were able to go without our wellies being overtopped! After a long day of travelling and data collection, it was time for everyone to cram into the minibuses and head back to the Cranedale centre for the night. Everyone was relieved to find out that when we returned we had some free time before our evening lesson and dinner. Many of us decided to play a huge game of tennis, which to say the least was a very eventful match; many of the hits did not quite go in the direction intended, causing them to travel over the tops of roofs and onto the other side of the centre boundary, hopefully not hitting anyone on their way down. Our second day entailed our travel to two other sites, including Millington Beck and Pocklington Beck in order for us to collect the final investigation data using the techniques we had learned on the previous day. Each group chose a site along the river within agreed boundaries and set out their equipment to carry out the investigation. Using 40x40 cm quadrats each group chose four spots in the stream where they were to take the four sets of data collection. The places that each group chose depended upon the sampling method that each chose, based on which they thought would provide the most representative data to support a conclusion in relation to our question. identify the indicator species between the two areas which included fresh water shrimp and mayfly larvae; this information allowed us to determine the water quality at each site. 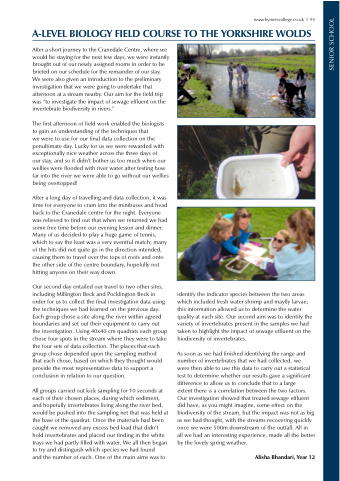 Our second aim was to identify the variety of invertebrates present in the samples we had taken to highlight the impact of sewage effluent on the biodiversity of invertebrates. all we had an interesting experience, made all the better by the lovely spring weather.